I’ll admit that as someone who grew up loving the classic 1967 Disney animated interpretation of Rudyard Kipling’s “The Jungle Book,” I was skeptical heading into this film. I wasn’t sure what to think of the entirely CGI film (minus the leading character), and wasn’t sure how I’d react to the new set of voice talents taking on the roles that have been ingrained in my head as belonging to a certain set of voices. However, I’m happy to report, this film works. It works far better than I imagined it would, and I enjoyed it quite a bit more than I expected to. This film really shows off what can be done with modern animation. Rather than a fully animated film, like the classic from the 1960's, this film is like a modern take on Walt Disney’s early film projects that involved a girl named Alice having adventures with an animated cat named Julius in an animated world. Much like these “Alice Comedies” director Jon Favreau casts young Neel Sethi in the role of Mowgli and asks him to play opposite CGI characters having adventures in CGI environments. Normally the mention of CGI comes off sounding like bad words, but here it’s so convincing it’s easily some of the best CGI animation I’ve ever seen put on film. The animals look real and move like real animals, and for the most part, the voices coming out of these realistic looking animals work as well. I wasn't sure how well these famous voices would fade into the animal characters they inhabit, but most of them work. Bill Murray gives an entertaining performance as Baloo, but is likely the one member of the cast I had the hardest time separating from his offscreen persona. I often had to remind myself that he was Baloo the bear not Bill Murray the bear. Other than that the rest of the cast (even as famous as they all are) disappear into the characters they embody. The last hurdle was for a young actor to be convincing while acting against green screens and nonexistent characters. And for the most part, he’s surprisingly good, even if he doesn’t always sell it. There were times it was obvious he didn’t know quite where to look and not every line reading was convincing, but for a first feature film (and a challenging one at that) Sethi did a solid job. The environments and the animals look so realistic many have taken to calling this film live-action, which is a testament to the technology and the animators who used it. It seems that obvious care was taken to maintaining the scale of the animals and environments as seen in the Disney classic. Wolves, bears and panthers dwarf Mowgli as they did in the original animated version, but maintaining the sense of scale works in its favor because it gives us a view of the world through young Mowgli’s eyes. To a child these animals and these environments would look enormous. This version of the story is a slightly darker version than Disney’s classic film (it fits somewhere in between the darker stories written by Rudyard Kipling and the light-hearted Disney version), but it maintains a few of the classic songs to lighten the mood, likely because they’re expected. Yet some of them feel shoehorned in. There’s a brief scene in which Baloo and Mowgli break into the classic “Bear Necessities” but the song that gets the most play is King Louie’s “I wanna be like you.” While the former works in context, the latter feels a tad out of place considering the somewhat eerie introduction to Louie the ancient (and extinct) Gigantopithecus. Christopher Walken plays him like a mixture of Vito Corleone from “The Godfather” and Kurtz from “Apocalypse Now” (both Marlon Brando characters from Francis Ford Coppola films for whatever that’s worth). So when he breaks out into song it’s a tad jarring. I also found Walken’s performance of the song, while fine (despite some awkward oo’s and ee’s) simply doesn’t hold up to the classic as performed by Louis Prima. Though I’m willing to admit that’s according to my biased ears rather than a fault of the performance or the film. I should also admit I very much appreciated the way composer John Debney utilized and repurposed both the original film's "Jungle Beat" tune and the music of "Bear Necessities" in dramatic ways that got my skin tingling. Suffice it to say a balance was struck between paying homage to the classic while keeping this version from feeling like a complete retreat of what inspired it in the first place. To the credit of screenwriter Justin Marks, attention was paid to establishing the jungle ecosystem, the hierarchy amongst groups of animals and the rules they all live by. Early on they establish a “water truce” which gives the film a unique opportunity to bring many types of animals (both predator and prey) together in peace. It also makes Mowgli’s manly tendency to build tools one of the centerpieces of the story. At first it’s a thing of fear and anxiety, as the rules of the wolf pack he grew up with keep him from utilizing tools and other such “man tricks.” That gives way to an acknowledgment of his ways within the animal kingdom that speaks to the film’s central theme of acceptance for all kinds as well as acceptance of oneself. The clear fear for the animals of the jungle is that Mowgli’s man tools and ingenuity will lead to the destruction of their habitat, the way it has countless times around the world particularly when fire’s spark in a wooded area. 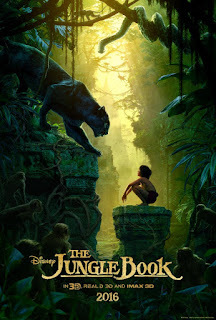 However, Mowgli finds ways to prove his unique human abilities can aide and improve the jungle, like when he creates a pulley system to save an elephant who had fallen in a pit. Again to Justin Marks and Jon Favreau’s credit, these elements could have easily felt shoehorned into the script, but they find ways to allow them to come out in ways that feel organic to the story. The animal with the most fear and anxiety for man’s tricks and tools is of course the imposing tiger Shere Khan (Idris Elba). He bears a scar across his face that is the result of an encounter with humans in the past, and his distrust of Mowgli turns to a deep seated desire to end his life. We know the basic setup and the general direction of the film’s story having seen this before, yet Marks and Favreau manage to find ways to differentiate their version in satisfying ways that don’t betray the story they’re reimagining. In fact I’d go as far as to say that this would be a version of the story that Disney himself might have been proud of. Perhaps it lacks the whimsey and some of the musical numbers of the 67 classic, but it’s still very much a good hearted parable that features lessons worth teaching to younger audiences today. For that and the overall quality of the filmmaking, I’m certain this will be the definitive, classic version of this story to a new generation. My only hope is they’ll go back and see 67 version, even if this one is likely to give it a run for it’s money.